An anonymous RTE reader from the internet sent the following question after Googling & listening to FairTax Radio Program - March 7, 2012. Question - Doug -- In your years of advocating the FairTax, how much legitimate criticism of the FairTax have you heard and what do you feel are the strongest arguments against the FairTax? Answer – The first thing I always point out in answering this type of question is that the FairTax is the result of a $22 million study done over a three to four year period in which Americans for Fair Taxation selected a group of non-partisan economists who provided economic papers responding to the results of numerous focus groups. The FairTax is the result of this work – a system that will be easy to understand, fair, transparent, & friendly to economic growth. Because of this starting point & the quality of the people (both economic & legal) who participated in the economic study &/or wrote the actual legislation I believe there are no legitimate criticisms of the FairTax. As I'm sure the questioner noticed on the March 7 radio broadcast former NJ Assembly Speaker Chuck Haitian played the devil's advocate to a fault before ultimately being won over by the end of the program. The great majority of people who become FairTax advocates start by reading The FairTax Book by Neal Boortz & former Congressman John Linder. 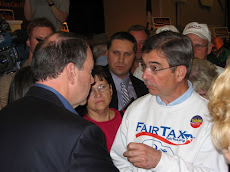 With re to arguments against the FairTax the aforementioned two authors specifically wrote a second book – FairTax: The Truth Answering the Critics – to answer & dispel lies that were intentionally circulated to mislead about the FairTax. I recommend that you read both of these books as well as The FairTax Solution by Ken Hoagland. Also check out www.FairTax.org as well as the section of this blog under The FairTax where there are about 25 postings from the FairTax basics to the most esoteric topics including many links to audios & videos. If you are like me your study will conclude that the FairTax offers a solution to our economic problems that when implemented will bring fairness & prosperity back to our country & its citizens. 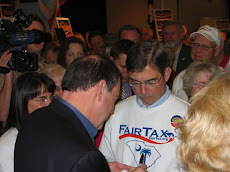 I believe that HR-25, The FairTax Act of 2011, is the most important piece of legislation for America in our lifetimes. The FairTax reverses the idea that our earnings first belong to the government & then, whatever is left, to us after withholding. Earnings under the FairTax belong first to the citizen in that our paychecks & pensions are received free of federal taxes - this turns every consumer into a concerned taxpaying stake holder. If you work, save, or invest you do not pay the FairTax – The FairTax Plan is a nonpartisan proposal that replaces all federal taxes on individual & business income, as well as payroll, estate, & capital gains taxes with a 23% (tax inclusive) national consumption tax on both personal & government consumption of new goods and all services in the U.S. The FairTax taxes only the final consumer or user in the U.S. of new goods & services meaning essentially it taxes retail sales & government consumption. Please do your own study & you will find that the above is just the beginning of the benefits the FairTax brings to America. Along the way if you have any questions please ask me. If anyone wants to learn the economic principles & benefits of the FairTax I will not be the reason that you don’t. Fabulous post you wrote there, Doug -- it's a well-thought-out answer to what could have been a difficult question to address. I have heard one criticism of the FairTax that might have some legs, but which is not a deal-breaker. The criticism goes like this. The FairTax replaces payroll and self-employment taxes. That fact, by itself, is a good thing, but it takes away a self-correcting mechanism. Employers today do not over-report payroll and self-employment income, which. if they did, would threaten the solvency of the Social Security and Medicare programs. Employers today don't do that because, if employers were to over-report, their payroll and self-employment taxes would rise. Under the FairTax, employers still have to report wages and self-employment income to Social Security. But the incentive against over-reporting disappears. The more over-reporting that takes place, the bigger the metaphoric pot of gold at the end of the rainbow. I would like to have a good come-back to that argument because I want the FairTax to become the law of the land. RTE - The writer describes a potential problem that is certainly long term in nature. In order to collect any Social Security retirement benefits you must have 40 quarters of earnings. Benefits are then based on your highest 35 years of earnings so the person who will make the most out of a fraudulent Social Security scam of overstating earnings after enactment of the FairTax is someone in their twenties who earns the minimum wage for the next 35 years but has his employer over-report these earnings up to the maximum – a highly unlikely event. The Social Security benefit formula is steeply graduated in favor of lower contributions meaning that the program is a partial redistribution of income from beneficiaries who earned high wages to those who earned low wages – i.e., a welfare transfer system. Establishment of each person’s Primary Insurance Amount (PIA) is based on their lifetime earnings adjusted to the wage index. The 2012 benefit formula calls for 90% of the first $767 earned, plus 32% of the amount over $767 to $4,624, plus 15% of amounts over $4,624 per month up to the maximum payment. Someone employed would need both himself & his employer to cheat in order to commit the fraud mentioned; but after enactment of the FairTax the self-employed would need only himself to cheat. It should be expected that the very great majority of self-employed people already earn an amount substantially in to the 32% benefit bracket if not well into the 15% benefit bracket so any cheating they would do would be financially minimized. It would take many years to learn whether or not this is a substantial problem & if it is adjustments could be made then to the legislation. I will add anything else I think of or provide any other comments I receive. RTE – questions with my answers below. Two parts. Reading only books and studies written by Fairtax advocates tells only half the story. You might get a copy of Joel Slemrod and Jon Bakija's book "Taxing Ourselves". It provides an unbiased assessment of all tax reform proposals, and the Fairtax doesn't fare very well! (1) How is it fair to double tax everyone's after tax savings/wealth when spent during transition? Everyone is currently paying embedded taxes on everything they buy today so the FairTax eliminates this continuation of double taxation. The current income tax system @ least triple taxes profits of multi-national companies (competing in the global economy) & their individual share owners – people like you & me. First American profits of companies in foreign lands are taxed there, then when those dollars are brought home they are taxed again, finally they are taxed the third time when the company pays a dividend to share holders. For domestic companies we have suffered through double taxation of dividends for decades. The current potential tax rate on individuals who own stock in a company is 44.75%. The FairTax is a tremendous improvement over this system. See also page 42 of FairTax The Truth & point #2 for more..
(2) How is it fair to "throw seniors under the bus" by forcing them to resume paying for their SS benefits with their sales tax dollars as well as shifting a significant federal tax burden to middle class retirees? The FairTax treats seniors fairly including your point about paying SS taxes in retirement when paying the consumption tax. Like everyone else seniors receive the prebate that ensures they pay no tax up to the subsistence level. In addition current Social Security benefits are indexed for any increase in prices because of the FairTax meaning that a senior couple could have anywhere from $50,000 to over $90,000 in consumption covered with no tax liability after enactment of the FairTax when taking the prebate & SS indexing into account. In addition the current income tax deduction (standard deduction plus personal exemption and senior deduction) allows less before taxes are due than the prebate covers meaning that under the FairTax seniors are getting tax relieve on a small portion of their social security check twice. Also many elderly seniors paid entitlement taxes less than the current 15.3% rate (SS + Medicare) meaning that they have a very good deal even if their taxes went up under the FairTax which they do not. (3) How is it fair to create a class of millions of lower income workers that pay no net federal tax due to the prebate, yet still qualify for full government retirement benefits? The FairTax does not create the system that you describe – we have it today already going strong in that @ least 50% of Americans do not pay any income tax & many of them get back their payroll taxes through the EIC. They then are still eligible for full government benefits. This system will be perpetuated if nothing changes. The FairTax reverses this through making America the tax haven of the world by producing products that have no tax component embedded in their value. When manufacturing jobs return to America after enactment of the FairTax it is only human nature for people to seek the dignity of employment that will never allow the underclass you mention. How is it fair that today's seniors, collectively, have thrown our grandchildren under the bus? What do I mean by that question? Collectively today's seniors have been the beneficiaries of government deficit spending - which the FairTax would redress. This spending includes Social Security and Medicare benefits that have been paid out to today's seniors disproportionately to the amount of payroll tax seniors paid in taxes over the years. A recent AP article confirms this. Go to http://www.nj.com/newsflash/index.ssf/story/social-security-not-deal-it-once-was-for-workers/4741dd70398441aa8935720d3f020fd8 . Long after you, as a retired military officer and lobbyist, are gone, future generations are going to have to pay for the benefits you received. We appreciate your combat service, but that service does not change the character of your benefits from inter-generational child abuse. Surely that is not what you fought for. Doug correctly argues that the FairTax will be fair to seniors, simply within its own four corners. But even if today's seniors would hypothetically have to pay more under the FairTax, that would still be fair. (4) Where in the Constitution does it allow the federal government to tax State and Local government consumption? The FairTax meets all of the Constitution’s requirements re uniformity & indirect taxes. In addition the FairTax is in compliance with the Supreme Court’s doctrine of intergovernmental tax immunity which had its origination in 1819 – over 30 years after ratification of the Constitution. This SC doctrine (no where to be found in the Constitution) has been extremely narrowed & limited by the Supreme Court especially since the 1930s & would not include the consumption taxes imposed by HR 25, The FairTax Act of 2011. (5) In addition, please explain your rationale for federal taxation of S/L government consumption in light of Section 704 of HR25. The section you cite refers to government enterprises like the Post Office so let’s compare the Post Office to Fed Ex. The short answer is that Express Mail & similar Fed Ex deliveries will compete on a level tax-paying playing field after enactment of the FairTax. Harvard Economic Professor Dale Jorgensen's report of May 1997 – "For efficiency allocation of economic activity private & public consumption must be treated on the same basis. For example Express Mail & Fed Ex provide the same delivery services & should be taxed in the same way. Government purchases should be taxed in order to facilitate comparisons between government spending on consumption & private consumption foregone. The same argument should apply to government payrolls, since the government can hire people to provide services it requires or purchase these services from the private sector." The postal worker is employed by a government enterprise that charges for their products & services & accordingly the U.S. Postal Service should be on the same tax basis as private businesses like Fed Ex. Government enterprises, at all levels of government under the FairTax, are treated the same as private businesses with respect to their purchases and sales to consumers. This means that any intermediate purchases by government enterprises are not taxed; only the final sale of goods or services to the consumer is taxed. In the case of state and local governments there actually are concrete examples of services where a municipal government would gain an unfair advantage over a private business if it weren't taxed. Garbage collection, water utilities, & gas & electric companies can be provided by private firms or local governments. If these governments weren't taxed under the FairTax, they would enjoy an unfair advantage over private firms in these respective businesses, and there would be a bias in the public sector favor. Taxing government helps confine state and local governments to their sovereign functions & helps make sure we get as much government as we really need & want. The taxing of government under the FairTax is a very important plank for those of us who think the FairTax is the bridge to controlling government spending. Texas & Florida have no income taxes but do rely on their sales taxes. These two states are the tenth & fifteenth largest economies in the world – much larger than most of the 130 countries you cite. There is a transition into the FairTax in that the IRS will finish its business & fade away in about two years. There will also be credits for any inventories in place in that embedded taxes paid on the inventories will be honored. If the FairTax does not deliver prosperity for America it will lapse in seven years @ which time we will have no tax system in place & we can start again. The FairTax gives America the chance to be the bridge for anything we an imagine. I agree that a consumption tax has merit, but I do not agree that the Fairtax is the answer. Too many moving parts and tries to do too much, too quickly. The above answers & the points from the original posting indicate what a powerful & necessary plan the FairTax brings to America when it is needed the most. How can you possibly list Texas and Florida as the two examples of a consumption tax? These are two districts within a larger nation and both recieve billions of dollars from the US government. RTE - The point of listing Texas & Florida is that they operate in America with a sales tax instead of an income tax & are big economies. In Europe you have both income taxes & sales taxes simultaneously in effect & the economies are terrible – so no country should have both income & consumption taxes. The evidence shows that when holding other things even approximately equal or @ least proportional states with sales taxes instead of income taxes are much more prosperous. Just look @ Texas & Florida compared to California & New York. Maybe even a better example of an economy that relied on consumption taxes was America from the time of our founding until 1913. Our founders relied on tariffs & excise taxes to fund the government. Tariffs are a form of user fees & consumption taxes are by definition a form of excise taxes. The proponents of the income tax went out of their way to address or counterbalance the tax sections of the U.S. Constitution in their writing of the 16th Amendment in 1913. Prior to 1913 the income tax was tried for short periods of time but could not be considered the major funder of the government. Here is what we know: One hundred percent of our children and grandchildren will be harmed if we continue on the path we are currently traveling – not to mention us. We shouldn’t want to put our future at risk any more than it already is. With this as a backdrop the FairTax should be compared 1) to the current system & 2) to the future we are likely to see if we don't pass the FairTax. I hope that you consider with an open mind the tidal wave of information I provide on ReturnToExcellence on the left hand side of the blog under “The FairTax.” I think no matter how valid your point may be about the two states it pales in comparison to all of the benefits derived from enactment of the FairTax.